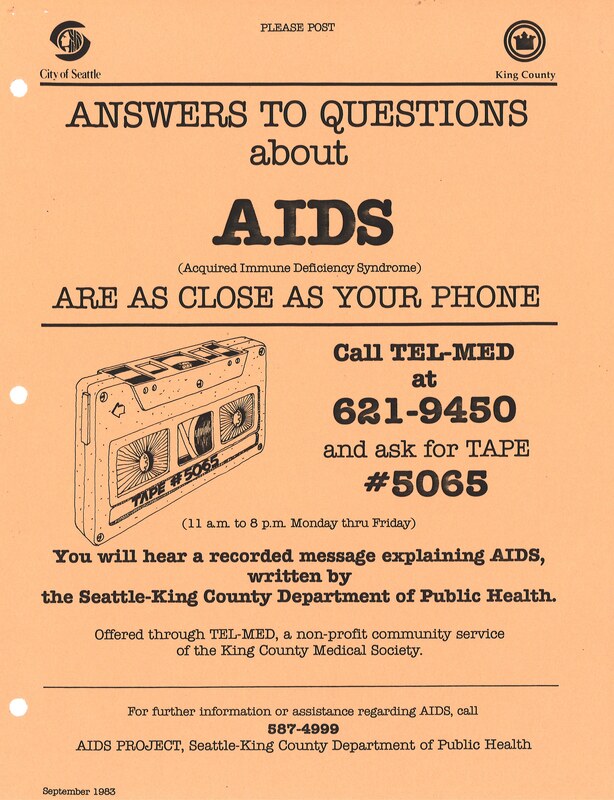 The Seattle-King County Department of Public Health initially focused on providing accurate information about AIDS through community meetings, press releases, newspaper interviews and recorded telephone information. The Department set up an AIDS information hotline at Public Health’s STD Clinic located at Harborview Hospital in Seattle’s First Hill neighborhood. The hotline was originally staffed by a single volunteer, Will Jones, who would later become a paid employee, training new volunteers as the hotline grew. 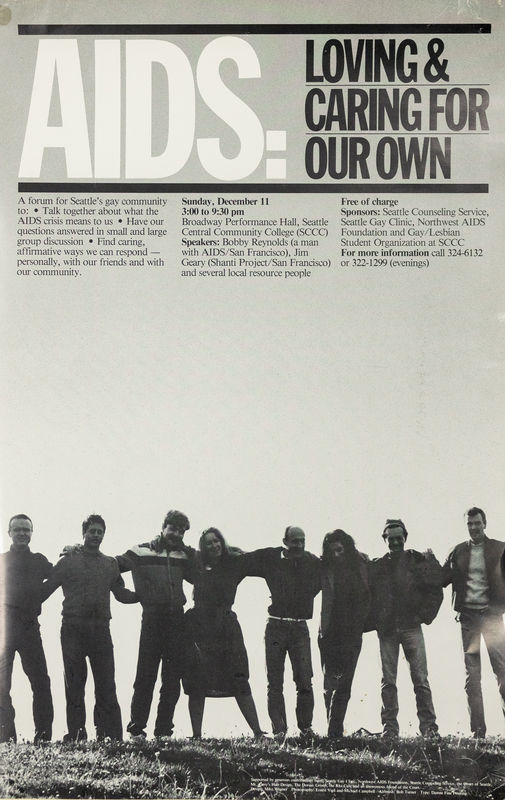 1983 poster advertising a community forum on AIDS in King County. Sponsored by the Seattle Counseling Service, the Seattle Gay Clinic, the Northwest AIDS Foundation, and the Gay/Lesbian Student Organization at Seattle Central Community College, the forum featured guests from San Francisco: Bobby Reynolds, a man with AIDS, and Jim Geary of the Shanti Project. Public Health worked closely with such community-based organizations. It may be hard to remember (or for younger people, to imagine) what communication was like before email and the Internet. The 1983 flyer above advertised recorded AIDS information heard over a telephone hotline. Series 11 – Clipping and press release files, Seattle-King County Department of Public Health. The Northwest AIDS Foundation was the lead organization in the local community-based response to AIDS. Dr. Robert Wood was an early NWAF Board president. NWAF was instrumental in helping promulgate Public Health’s prevention messages and strategies. State and local officials, including King County Executive Randy Revelle, Seattle Mayor Charles Royer, and City and County Councilmembers, along with other community leaders, served on NWAF’s Honorary Board of Directors. From the mid 1980s, most public funding of other AIDS service organizations passed through NWAF. NWAF later merged with the Chicken Soup Brigade to become the Lifelong AIDS Alliance. 1984 Northwest AIDS Foundation Honorary Board of Directors. In 1983, the Department proposed an AIDS surveillance and education program to provide assessment, referral, and counseling services; to gather data and contribute to national research; and to provide accurate information to at-risk groups and a fearful public. The plan was developed in collaboration with the Seattle Gay Clinic and included funding for the AIDS hotline and one nurse practitioner. King County Executive Randy Revelle recognized the need to fund AIDS programs without waiting for the next County budget cycle. He understood the implications of AIDS and its coming storm and supported emergency action, in spite of advice to the contrary from some advisors. “In Seattle we really couldn’t wait for help…. Tim Burak, Seattle Gay Clinic volunteer and Seattle King County Department of Public Health employee, spoke at a meeting of the American Public Health Association about community involvement in establishing the AIDS assessment clinic. Below, listen to the recording of Burak’s presentation from November 15, 1983. Community activists, organized by the Dorian Group, the Greater Seattle Business Association, and the Seattle Gay Clinic, rallied at City Hall and spoke before the Seattle City Council. Representatives from the the Northwest Physicians for Human Rights, the Freedom Socialist Party, the Seattle Mayor’s Office, the Seattle Office of Women’s Rights, and Seattle-King County Department of Public Health, all supported emergency funding. The proposal would establish a formal partnership between the Department and the Seattle Gay Clinic. Tim Burak described this relationship in this 1983 program summary referred to in his APHA presentation (audio above). By August 1, 1983, both the Seattle City Council and the King County Council had passed emergency funding ordinances. Together they became the second local jurisdiction in the United States, after San Francisco, to allocate public funding directly for the fight against AIDS. King County Council Ordinance 6476 allocating funds for the proposed AIDS Surveillance and Education program. What was it like to visit an assessment clinic in the days before there was an HIV test and when there was no known treatment for AIDS? “There is no test for AIDS. The AIDS clinic does not diagnose AIDS. It assesses risks…. 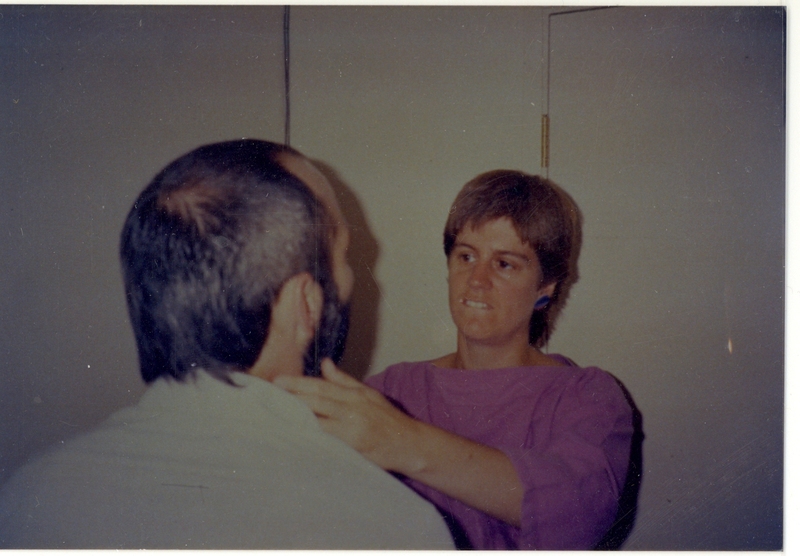 Nurse practitioner Joanne Tilton and Frank Chaffee, posing as a patient for the photo, at the AIDS assessment clinic (ca. 1986).